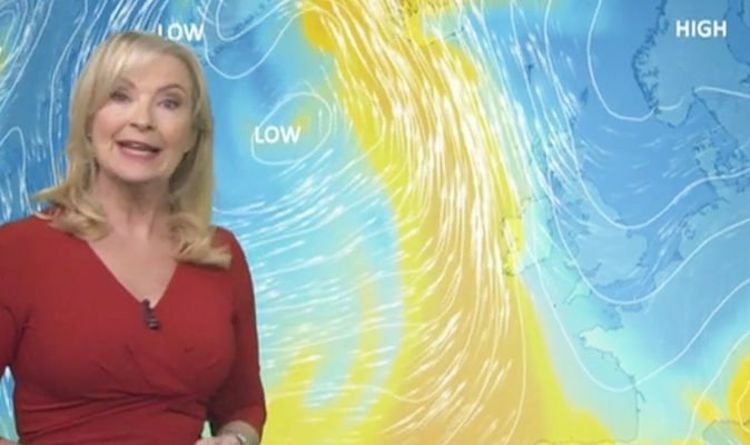 BBC Weather forecaster Carol Kirkwood warned high pressure sitting over the UK will guide sub-zero Arctic air into Britain. Ms Kirkwood warned there will be a touch of frost for rural areas on Thursday night as the bitter Polar air strikes. Into Friday morning, the BBC Weather forecaster said: “A nippy start for one of us but the clear skies again. We will start with some sunshine. But the cloud is going to continue to build through the course of today. And tomorrow will turn out to be a cloudier day than today. “Nonetheless, there will still be some holes in that cloud, temperatures down on today though. And, again, feeling cold if you are going for a stroll along the North Sea coastline. “Then as we head into the weekend where we have got high pressure anchored over Scandinavia and low pressure in the Atlantic, and between them, look at the wind. “It is going to be pretty windy across western Scotland and Northern Ireland. "We could have gusts as much on Saturday as 40 or 45mph. “Weather-wise, we still are looking at a lot of dry and settled conditions. There will be sunny intervals and temperatures below average for the time of year. But temperatures drop even more as we head on into Sunday. “And it will be fairly cloudy by the looks of it and breezy on Sunday. So, in summary, the weekend forecast is dry for most, sunny spells, windier and feeling chilly. Freezing conditions will hold out until the middle of next week when there are signs of the weather turning milder. Met Office meteorologist Luke Miall said: “For the rest of the week and the weekend it is going to be pretty cold for the time of year, more notably by night when there will be a risk of widespread frosts which could occur even further south. “There is high pressure over Scandinavia, and with this being to the northeast of the UK, air will be coming in from an easterly direction from the Baltic region. The chilly conditions are a stark contrast to the weather conditions seen across the nation last year when temperatures in April were the warmest on record.